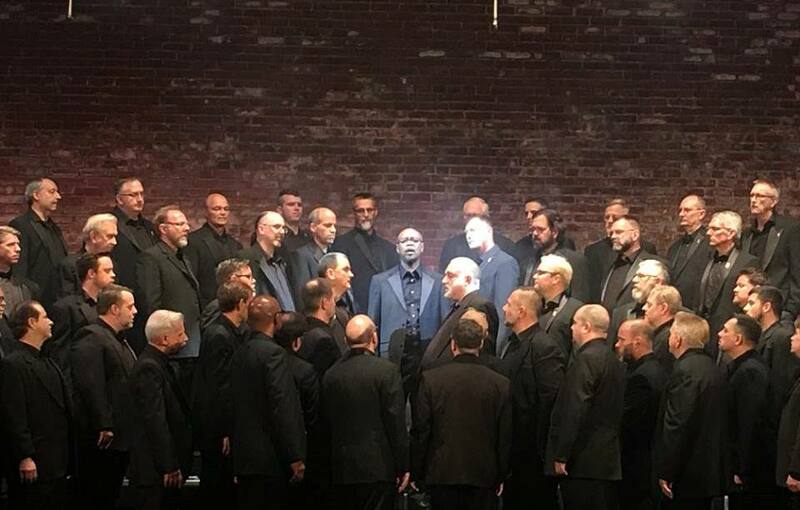 A newly commissioned oratorio and a smattering of familiar tunes filled Saturday’s concert from Kansas City’s own Heartland Men’s Chorus. The oratorio was complimented by some extensive staging and choreography. There was a darkened screen that dropped and retracted at various times. This screen would separate the soloists from the choir and at various points was projected upon with imagery. A striking image was of a field of headstones, that, when projected upon the screen intermingled with the shrouded but still-visible choir and reminded us of the masses lost. The extensiveness of the production did get in the way occasionally, as when smoke machines meant to simulate explosives gave off their signature hiss instead and reminded us that we were watching a play. A heightened version of this occurred when, at the big finale, all four of the unknown soldiers were visible outside of their flag-caskets and the flags quickly descended at once, clearly meant to be a crushing moment. However, one flag caught on a soloist’s head, leaving the lower half of his torso and legs exposed. Perhaps an inadvertent metaphor for how nationalistic fervor leaves faceless bodies in its wake? The soloists’ performances themselves, on the whole, were quite good. Christopher Puckett, who performed the role of Edward F. Younger, the man tasked with selecting the Unknown Soldier, was especially impassioned. David M. Sanchez, Unknown Soldier #2, who sang of the struggles of being a black man in the military at that time, had the fieriest section that erupted into applause at its end. Christopher Kurt, Unknown Soldier #3, mostly sang well of being separated from his love (another soldier) by death and circumstance, but the part unfortunately sometimes existed outside of his range. Unknown Soldier #4 was merely a boy who was resigned to stand there, as his mother (mezzo-soprano Aidan Soder) sang in his stead. After the intermission, the concert lightened considerably. Different smaller chamber groups as well as the full choir sang numbers ranging from arrangements of songs like Michael Jackson’s “Man in the Mirror” or “Alexander’s Ragtime Band” to Lee Greenwood’s “God Bless the USA.” However, the second half also had the single most affecting sequence on the entire concert—Joel Thompson’s Seven Last Words of the Unarmed, a collection of seven pieces for men’s chorus. The only text used is the final spoken words of seven unarmed black men: Kenneth Chamberlain, Trayvon Martin, Amadou Diallo, Michael Brown, Oscar Grant, John Crawford, and Eric Garner. The piece was devastating, but this lies not with the written music or even its performance, but rather the unstated implications that it holds: that people and lives are always affected—and yes, ended—by the choices of individuals. The bullet was fired by a person, mines were laid by a person. Those four unknown men and those seven unarmed men all died as a result of societal forces larger than themselves in the sense that the situation was laid out by others’ collective actions beforehand. Compassion is needed. Sea change is needed. Copyright © 2018 KCMETROPOLIS.org Used by permission.